Heat oven to 325°F. Spray 9-inch springform pan with cooking spray. Wrap outside bottom and side of pan with foil to prevent leaking. Meanwhile, in medium bowl, mix spinach, ricotta cheese, cream cheese, mozzarella cheese, 1 egg, 1 clove garlic, 1/2 teaspoon of the salt and the pepper. In large bowl, mix macaroni, 1 1/2 cups of the pasta sauce, 1/2 cup of the Parmesan cheese, remaining 2 cloves garlic and remaining 3/4 teaspoon salt. In small bowl, lightly beat remaining 5 eggs, and stir into macaroni mixture. Place one-third of the macaroni mixture in bottom of pan. Gently spread ricotta filling in middle of macaroni mixture, leaving 1-inch border around edge. Spoon remaining macaroni mixture around edges and on top of ricotta filling. Ricotta filling should be completely enclosed by macaroni mixture. Bake until firm to the touch and top is golden brown, about 1 hour and 5 minutes to 1 hour and 20 minutes (at least 165°F). Place on cooling rack; let stand 5 minutes. Run thin knife around edge to loosen. Remove side of springform pan. Let cool 15 minutes. Meanwhile, heat meatballs as directed on package. Heat remaining sauce in 3-quart saucepan. Add 1/2 cup of the heated pasta sauce to meatballs; toss to coat. 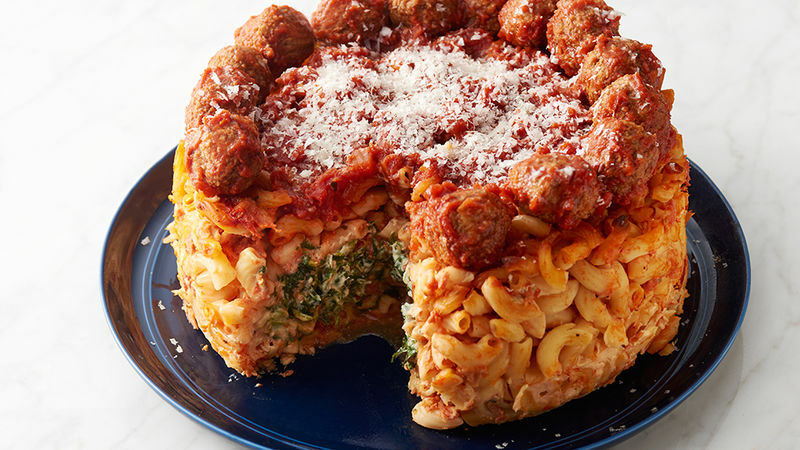 Just before serving, transfer baked macaroni to serving platter; place heated meatballs around top edge. Spoon remaining sauce in middle of top of “cheesecake.” Sprinkle remaining 2 tablespoons Parmesan cheese over top of “cheesecake.” Cut in slices to serve with more Parmesan cheese on the side, if desired. Any Muir Glen™ pasta sauce will work well in this recipe. Letting the “cheesecake” stand for 15 minutes before serving allows the pasta and eggs to set firmly enough to provide the necessary structure for this dish.